I've had Two Fold on my 'Add to the closet' list for a while now. I discovered them shortly after my switch to slow fashion, and knew that eventually a piece would speak to me and I'd have to have it. Each piece is so beautiful and simple that now it's the perfect addition to my closet. Two Fold is based in Charlotte, NC and focuses its efforts on environmental and social consciousness. They release two capsule collections per year (Spring/Summer and Fall/Winter) with everything being made to order. As opposed to the fast fashion "micro-seasons", releasing just two collections a year promotes quality over quantity. Two Fold is committed to using organic and sustainable fabrics, therefore sourcing fabrics like organic cotton, tencel, and raw silk. In addition to using sustainable fabrics they also use packaging supplies that are 100% recycled. Another brand focus is to encourage women and inspire all to live their best lives! Yesssss!! As women, we have such an incredible power and opportunity to build each other up, and its incredible to see the things that can happen as a result of doing that. Just another reason to get behind this brand! As mentioned above, all pieces are crafted from sustainable fabrics but the one piece that I fell in love with in the Spring/Summer collection was the Krissy tee. Linen, it gets me every time. The Krissy tee was available in a few different color options but when I saw the stripes, I was sold. 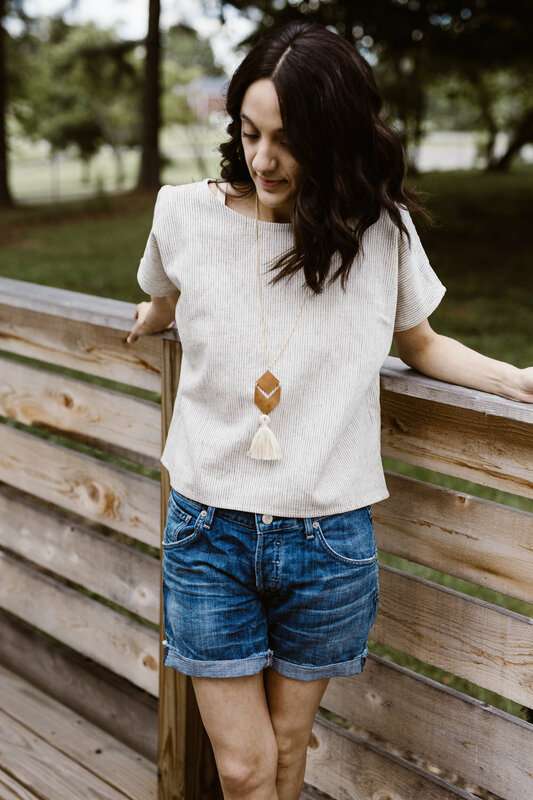 The drape on this tee is so perfect and the top itself is so versatile. I've styled it with jeans or shorts and sandals; but I've also layered it over a dress and it worked just as well! I love love love Two Fold and everything they stand for! Sustainability, ethical production, and women helping women I honestly can't think of anything better to support. I hope you'll check them out and fall in love with their pieces! You can shop Two Fold here. Note: I was not compensated for this post, I just believe in this brand. All thoughts, opinions, and photos are my own. Thank you guys for reading and helping to spread the word about ethical fashion!